To get the flavor of the city, go hungry, and make plans for stops at these southern favorites that are replete with homey dishes. The culinary equivalent of a hug, comfort food is one of those things that welcomes travelers to Atlanta like nothing else. Today the city is a global business center, the kind of place where you'll hear Mandarin, German or French spoken right along with the tones of a Southern drawl, but step beyond the skyscrapers and corporate headquarters of the business districts in Downtown, Midtown and Buckhead, and you'll feel the regional influence, from blues clubs tucked away in the city's neighborhoods to restaurants where chefs reference southern standards. To get the flavor of the city, go hungry, and make plans for stops at these southern favorites that are replete with homey dishes, the best of which are elevated from the common to the sublime by talented chefs. Married chefs Chris Malfitano and Karla Geniso present the Lowcountry classic dish shrimp and grits at The Rotisserie Shop. 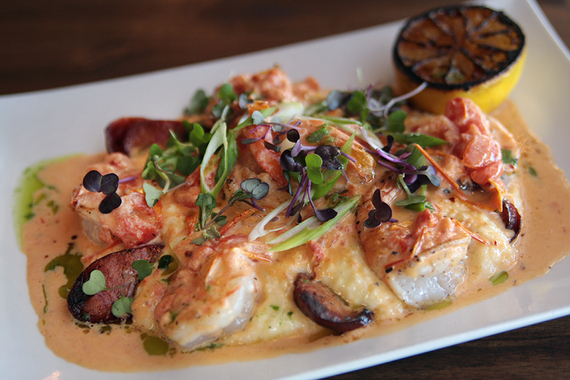 One bite is all you'll need to become a fan of what some folks consider a life-altering revelation in food--dense, sweet wild Georgia shrimp and crispy local Andouille sausage mingled with soft, creamy stone-ground grits drenched with roasted tomato butter sauce. If that's not yum, we don't know what is. 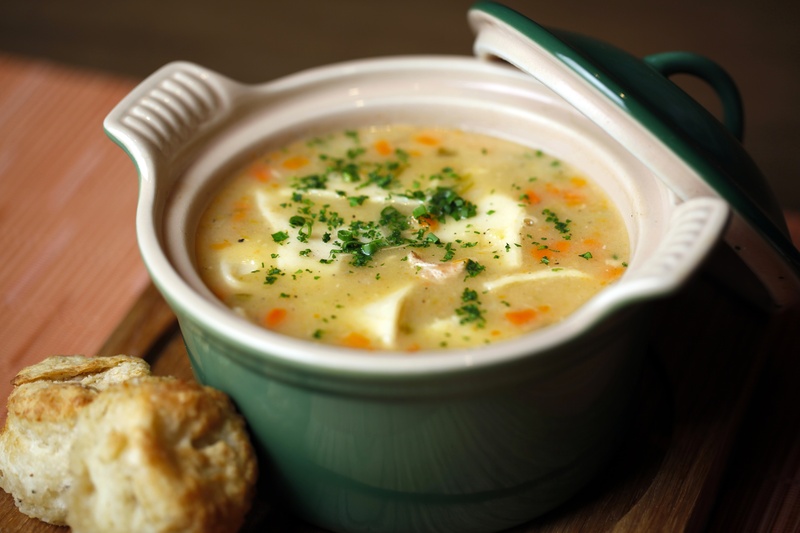 A signature dish at Southern Art and Bourbon Bar, Addie Mae's chicken and dumpling soup is based on Chef Art Smith's mother's recipe and named in her honor. Smith, a Georgia native who, for 10 years worked as Oprah Winfrey's personal chef, continually gets his mom's advice on how to perfect the soup ("don't crowd the pot too much or it will take all the juices out"). The tender chicken, luscious strips of dumplings, hearty veggies and delicate broth soothe stomachs and souls daily. Crave something more spirited? The adjoining Bourbon Bar pours more than 70 bourbons plus an array of cocktails. Smoke Ring / The "Best Damn Grilled Cheese, Ever"
At Smoke Ring the menu boasts the "Best Damn Grilled Cheese, Ever." A bold claim by Chef Jordan Wakefield that convinces with each mouthful of the sandwich that showcases a melted blend of fontina, smoked gouda, gruyere and parmesan cheeses, plus a layer of fire-roasted poblano peppers for a mild spicy kick and Vidalia onion marmalade for a hint of sweetness. It's melt-in-your-mouth Mmmm with a bonus: The garnish is a dill-pickle spear wrapped in bacon. Hungry for more meat? Go for the Georgia-style barbecue and take your pick of meat and sauce. The new recipe for the fried chicken at Buckhead Diner was in development for more than three years. This update has more complexity than previous incarnations, with a secret mix of spices and a few other tweaks that Chef Charlie Schwab and owner Pano Karatassos won't reveal. The duo worked on the recipe refinements together and the dish has been earning raves since its debut this summer. 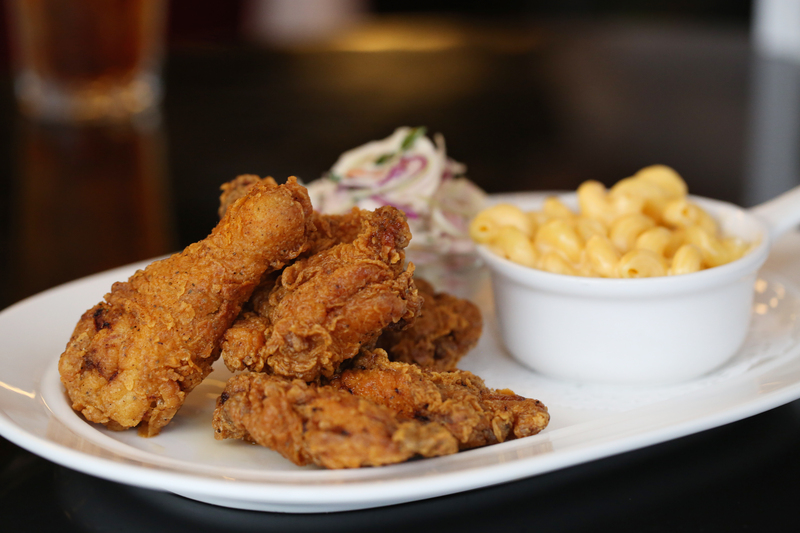 Available for dinner on Sundays and Wednesdays, the organic pan-fried chicken is served with creamy mac 'n' cheddar and tangy coleslaw. 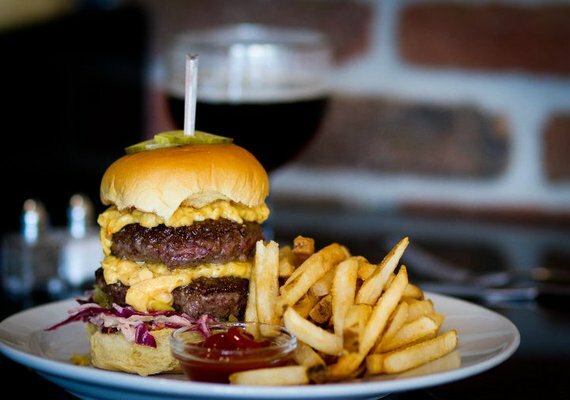 The award-winning Kaleidoscope Burger by Chef Joey Riley at Kaleidoscope traps multiple Southern classic flavors in a bun: Single or double beef patties are topped with pimento cheese, slaw, green tomato chow chow and bread and butter pickles. If that sounds like too much, trust us, it isn't--your tongue will happily clean up any juicy drops that slide down your arm. This burger will have you whistling "Dixie," and the thin, crisp-yet-tender fries served alongside will have you marching in the aisle. The menu at MetroFresh changes daily, reflecting the season and Chef/Owner Mitchell Anderson's current mood and inspirations. But there's one constant: Mitchili--and the knowledge that it's always available--helps keep local fans from rioting. 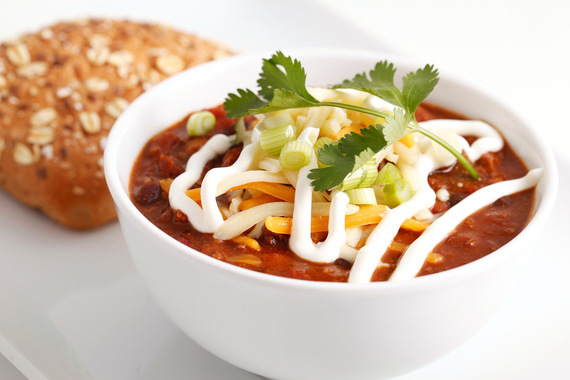 The turkey chili is a bowl of warm happiness with just the right amount of spice in each satisfying spoonful. It bursts with flavor while staying true to the mission of healthy fare. Since opening the restaurant in 2005, Anderson showcases fresh ingredients to the extent possible, seeking out local, seasonal and sustainable products. Chef Dave Berry's pimento cheese and grits fritters at Horseradish Grill, Atlanta's oldest continuously operating restaurant, manages to combine three Southern favorites--pimento cheese (a textured blend of cheddar, mayo, pimento and spices), grits and deep-frying. Did we say three? Double that with country ham and mayo combined in the accompanying aioli, plus there's a mound of sweet-tart bread and butter pickles. The crunchy yet creamy, salty yet savory, familiar yet innovative dish proves why The James Beard Foundation named Berry "America's Rising Star Chef." 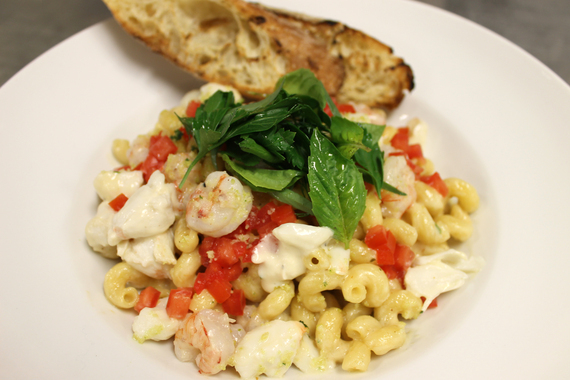 A perennial favorite, mac & cheese has been on the menu at Park 75 for many years. No wonder, since Chef Robert Gerstenecker packs his cheesy pasta with jumbo lump crab meat and rock shrimp sourced from the Georgia coast whenever possible. The result is a savory, sweet, creamy delight. Talk about a wow factor. Taste buds do a happy dance; stomachs slouch in contentment.